In the late summer of 1901 Picosso visited the women's prison of Soint-Lozore. His first-hand experience of this squalid environment informed the poverty-induced melancholy of many of his 'blue-period' works. The prison was, in some respects, the product of the social circumstances of turn-of-the-century Paris. Desperate poverty had induced extensive prostitution, which in turn caused the spread of venereal diseases. This inevitably led to further desperat poverty and many of the inmates at the Soint-lazare prison were ex-prostitutes suffering from such diseases. The prison, well known in its day, had become the subject of both artists and writers, and even appeared in the lyrics. of popular songs sung in the cafes and cabarets of Montmartre. Picasso's Mother and Child depicts on aspect of such incarceration that particularly disturbed the artist - the presence of children in the prison. The mother, identifiable as a Saint-lazare inmate by her white bonnet, is represented as an abject figure whose attenuated form conveys a sense of overall despair. 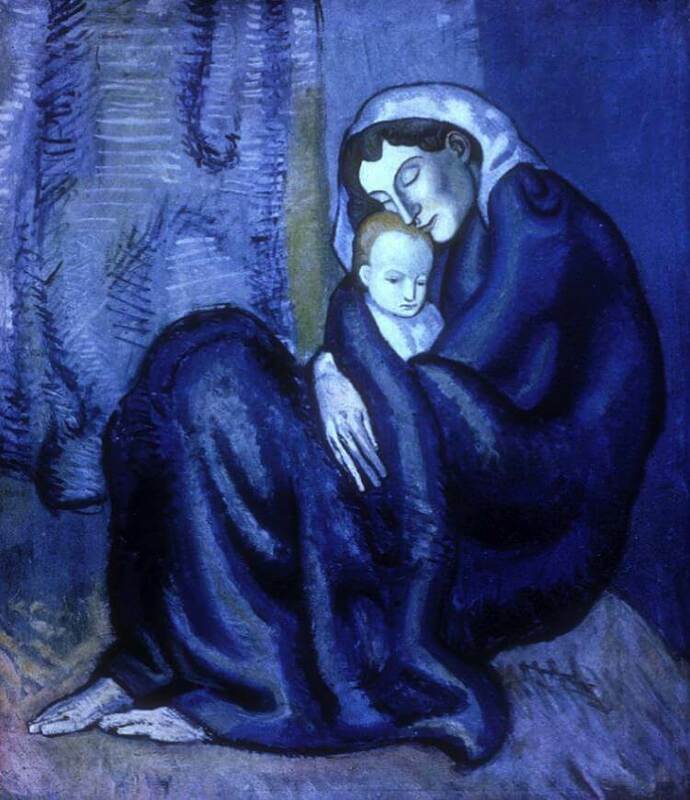 However, Picasso has allowed a sense of hope to permeate the work, through his obvious allusion to the Madonna and Child.